I was delighted that so many of you were taken by Anne and Dominik's farmhouse renovation project that I posted about earlier this week. 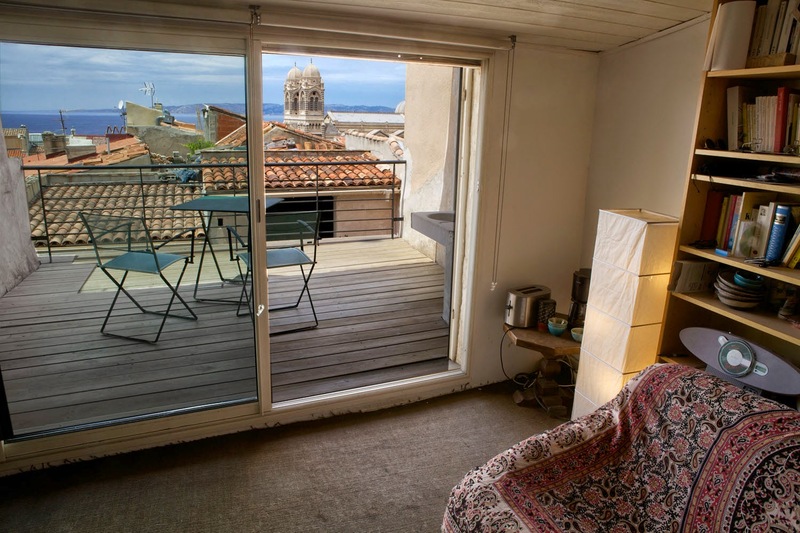 But, such dreams come at a price and after a considerable debate, they have decided to sell their rather amazing apartment in the Panier district that is the heart (and I do mean the beating heart) of the fascinating city of Marseille. I can see from whence their ideas where born, for despite it's incredibly central location, there is definitely an air of a country mazet in it's façade. Wouldn't you agree? Remi and I are both big fans of atypical spaces. The more levels and surprising twists and turns, the better. This apartment fits the bill perfectly. 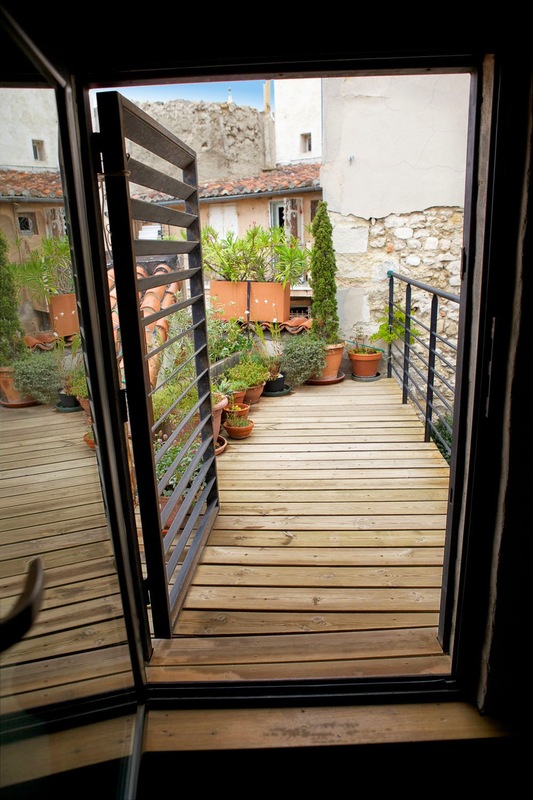 ...but also in that it leads out onto it's own private deck. Can you imagine starting your day sipping your tea in the sun? I can! 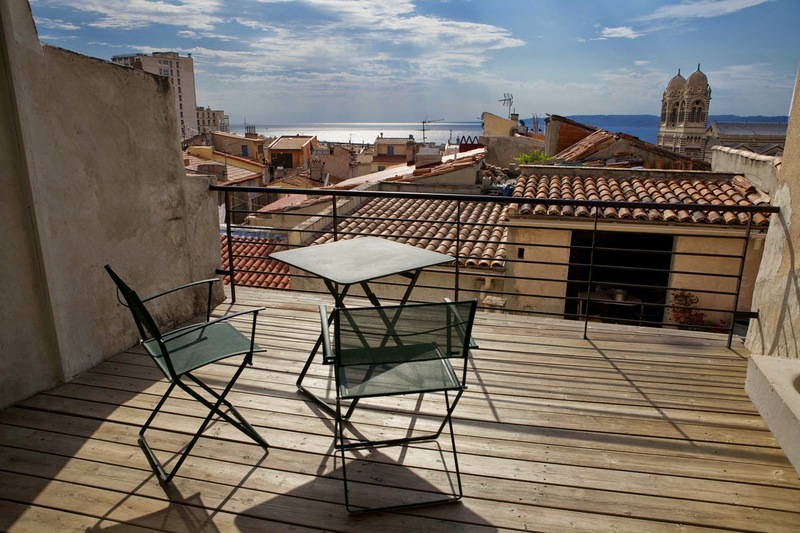 However, my favorite space is most certainly the terrace that opens off of an additional living area with incredible views over the towers of the Major Cathedral and the sea (something that is extremely sought after in Marseille). 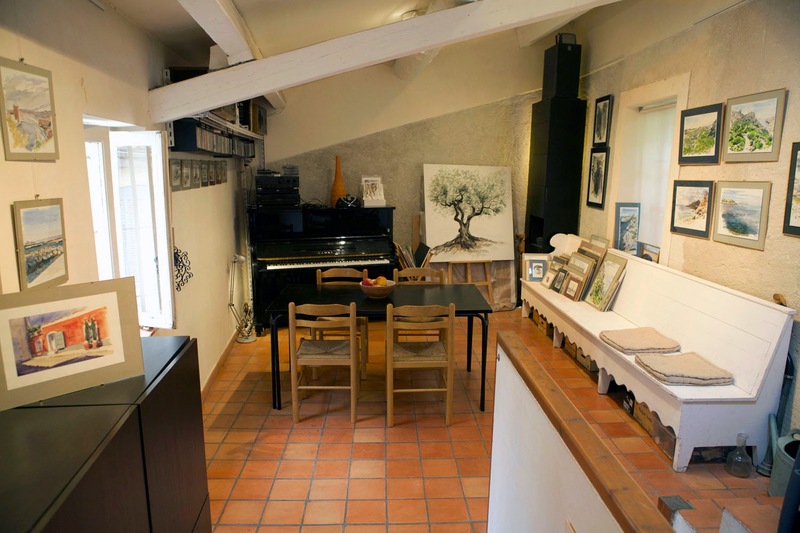 For me, this large apartment is all about the essence of what experiencing the best of life in lively Marseille can be. It certainly is an up and coming city - listed as #2 on the New York Times 2013 list of "Places to Go" and home to the European Capital of Culture in the same year. How I hope that this unique space finds a good home! Dans une impasse tranquille de la plus belle place du Panier : la vie de village au coeur de la ville, à 2 pas du Vieux-Port, du Centre, du MUCEM. Maison-appartement atypique, sur 2 immeubles (2 entrées indépendantes possibles). Surface 115m2 pour 6 pièces + 2 SdD et WC + 2 terrasses dont une sur belle chambre et une de 12m2 sur salon avec vue sublime sur la mer et la Major. Idéal pour familles et couples (mais trop de marches pour personnes âgées ou enfants en bas âge). Toiture neuve, des pièces rénovées, d’autres restent à faire. Place tolérée pour 1 voiture. 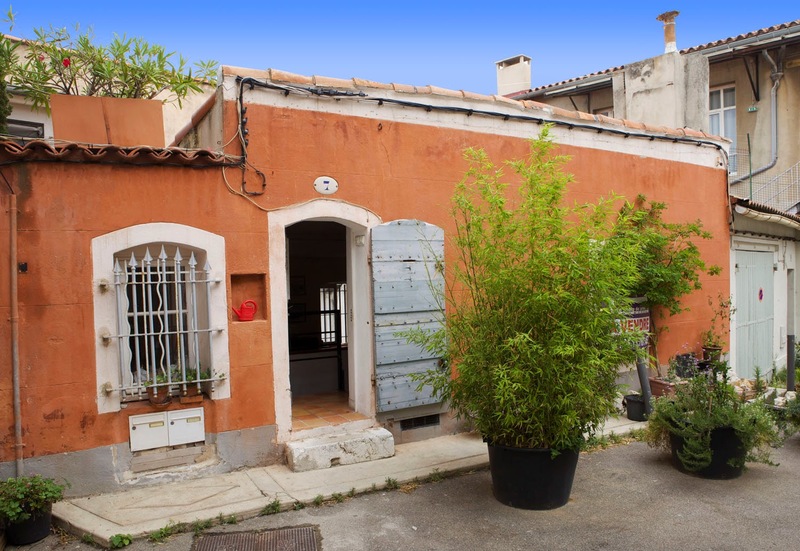 In a quiet cul-de-sac just off of the prettiest square in the Panier: enjoy village life in the heart of the city while being only steps away from the Vieux-Port, the City Center and the MuCem (more about that at Lost in Arles soon!). 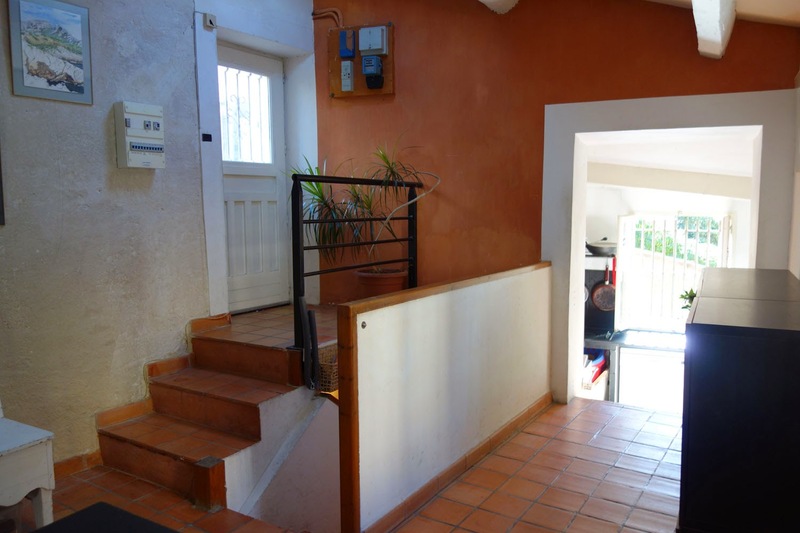 With a surface of 115m2 (1238 square feet) there are 6 rooms with 2 baths and a WC, as well as 2 terrasses, including one off of a lovely bedroom and another of 12 m2 leading off of a living area with sublime views over the sea and the Major Cathedral. 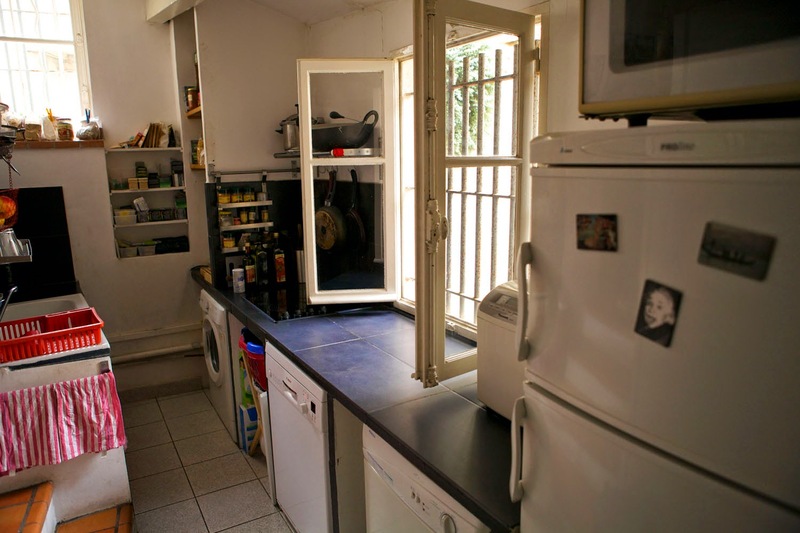 Ideal for families and couples (but with too many stairs for the elderly or families with very young children). 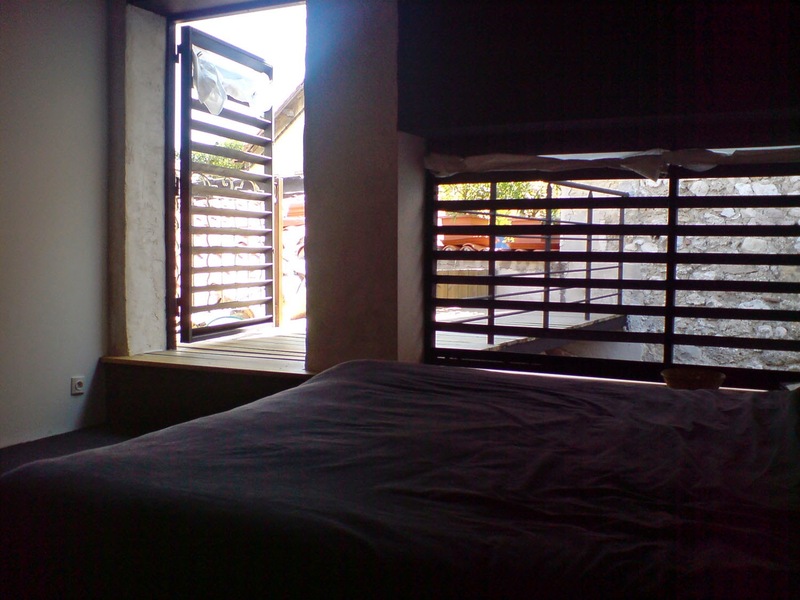 The roof is new and some rooms have been renovated while others are still ready for you to make your mark on them. Parking is possible for one car only. Real estate agencies, please do not respond to this ad. I am so happy to try and help this wonderful couple get the word out about their apartment (and if you know of anyone who might be interested, then by all means please pass it along! )...And speaking of passing along a good thing? So many of you expressed interest in my dear friend Vickie Lester's new and self-published novel, "It's in His Kiss" - well, just in time for the first day of summer (hooray! ), she is offering a free Kindle download on Amazon tomorrow, you can get all of the info that you need about it here. Thank you for reading and enjoy the rest of your weekend everyone! We are certain that such an an attractive apartment and one that is so well situated, with sea views to add to its desirability, will sell very, very quickly. We wish your friends good fortune. Thank you very much Jane and Lance. Coming such arbiters of style as yourselves, that is a wonderful prediction! Keith, I think that I could live many happy years just in that one room with the terrace! ;) Thanks for joining up too!! I absolutely adore the views. Have a wonderful weekend Heather. Gotta say, if things were a little different, I'd whip my checkbook out right now. The place is gorgeous. Wishing your friends bonne chance! Lovely place. What a wonderful place. I'll send to a friend who worked in M and is, I believe, now close to retirement. How gorgeous. Sea views are so reassuring, centering, in my book. It is a dream of mine to live with a sea view...just once...even when we lived near to the sea in California (when I was a teenager) I found it so calming. That looks like such a charming place to live! Wish I could move somewhere scenic, but I'd miss family. Omg - what an amazingly beautiful apartment!! Wow - I thought is would be much more expensive than that - especially with that view! At least they don't have to worry that it won't sell; it should go like hotcakes! Especially with your beautiful post about it - thanks for sharing it with us! Beautiful place. Of course the sea seen from the terrace. Mrs. Abstract and I are ready to move after I learn the language. Have a nice week Heather. Oh my computer is acting crazy! I just wrote you a long response and my computer ate it all down to the last syllable. The short version: if you do decide to move I heartily, heartily second your idea of at least getting the basics of the language down before you go!